Challenging the Bonsai A to Z entry for Cammellia (Camellia). 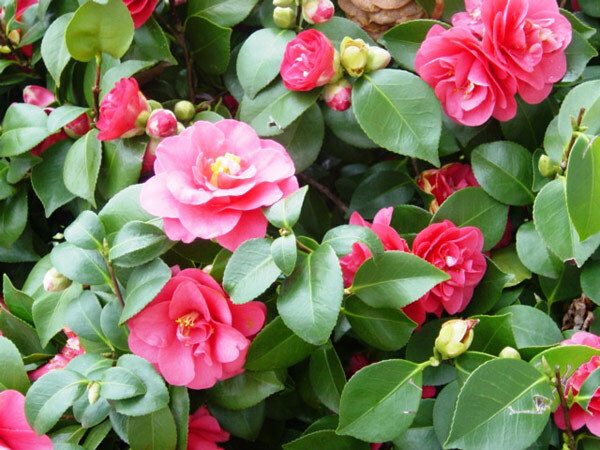 Three main varieties : Japonica (Common Camellia): Shiny, oval, dark green leaves with red/white/pink flowers March to May. Reticulata: Long, narrow dark green leaves and big, funnel shaped pink/red/purple unscented flowers with 15-20 petals. Sasanqua : Drooping habit with lighter green, small, oblong, blunt-ended leaves with white/pink scented flowers with 6-8 petals. STYLE : suited to every style, except formal upright and broom. WARNING : Branches are brittle so protect with raffia. Do not leave wire on the tree for more than a month or two. LOCATION : Semi-shaded site preferred but does need light in order to flower. Does not like to be moved as it is sensitive to changes in light and temperature conditions . REPOT : Annually in a deepish pot in late spring, when branches have finished growing and buds have formed. SOIL : Must be in acid soil which can be clayey. pH 4.0-5.5. PRUNE : Hard prune after flowering and before new shoots harden. WATER : Water well in growing season, sparingly in winter. FEED : Reacts badly to chemical fertilizers. Feed with slow acting organic fertilizer. Best feed is a compost of its own leaves. There are 819 entries in the A to Z and the pages have been viewed 3061108 times. Help us to increase the number of relevant bonsai terms included in this A to Z of Bonsai Terms. We include manufacturers and dealers in the dictionary, if you are one or know of one not mentioned then just click the link above and add an entry. If you have a favourite bonsai tree not mentioned just add an entry. We are trying to create a unique single free source for all bonsai terms and hope to capture worldwide bonsai terms for bonsai trees, bonsai clubs associations and national collections and the A to Z is free marketing for bonsai businesses and bonsai clubs.